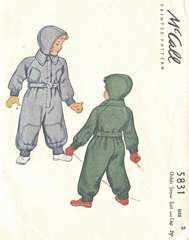 Front buttoned snow suit and separate cap. Snow suit has carriers and belt, collar and neck strap and purchased knitted cuffs on sleeves and legs. Childs Size 2; Chest 21; Waist 20. Pattern is cut and complete. Envelope is in very fine condition - average color aging but clean with almost no wear or tear. Pattern pieces are all in fine condition. Instruction page is complete with one torn corner portion.